If you’re looking for a basic, no-fuss wireless mouse to use with any Windows or Mac computer, we have one that you’re going to love. The Logitech Wireless Marathon Mouse M705 looks pretty much like any other simple mouse on the planet, but it has a killer hidden feature that your current mouse can’t tout. 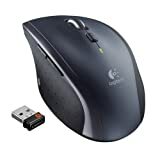 Pop in two AA batteries and this Logitech mouse will last for three years before the batteries need to be replaced. That’s not a typo, folks… three years!